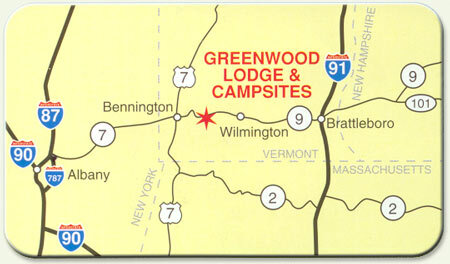 Open: Mid May - Late Oct.
Hostel - lodging and 40 well-spaced, mostly wooded campsites adjacent to The Green Mountain National Forest. 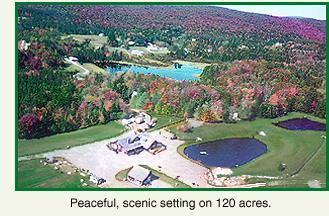 Swim, fish, boat, canoe, hike, bike on our 120 acre property with three ponds. Rec-room, playfield, volleyball, horseshoes, tetherball, basketball backboard. 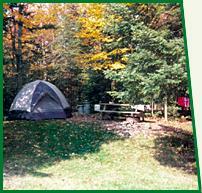 Clean, modern, heated bathrooms, free hot showers, dishwashing sink, microwave oven, picnic tables, fire rings. W&E, 20/30/50 amps, dump station. Modem friendly phone. Leashed, quiet, attended-to pets only. Ice, firewood. AC, electric heaters ($). True's General Store is opposite us on Route 9. 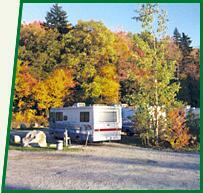 Appalachian Trail, Somerset & Harriman Reservoirs, summer theaters, flea markets, antiques, museums, Mt. 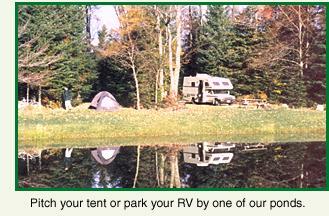 Snow, golf, horseback riding, seasonal events nearby. Entrance is at Prospect Ski Mountain or Greenwood Drive, Rt. 9, 8 miles east of Bennington, 32 miles west of Brattleboro, exit 2 off Interstate 91.
, mail: PO Box 246 Bennington VT 05201 or by phone or fax: (802) 442-2547.